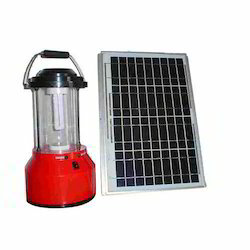 Our knowledge in the area of solar products has enabled us to fabricate solar lanterns that are lightweight, dense in design, portable and highly well organized. These solar lanterns can be effortlessly charged by connecting it with the solar power pack through a charge connector. We are among the renowned manufacturers of wide range of Solar Lantern that is an outstanding reserve of energy conservation. Our products are easy to install and is widely valued among the clients for its terrific performance and durability. Our complete product range complies with global quality standards and satisfies the speckled requirements of the customers efficiently.